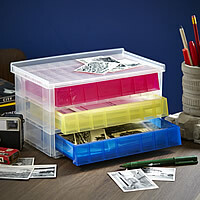 16 x plastic stacking boxes in a neat organising unit to wall mount or have freestanding on your desk. 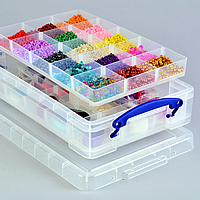 Great for sorting beads and buttons, needles and threads etc. 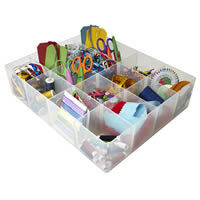 Great general purpose box from Really Useful Boxes for the contents of your desktop. Ideal size for a ream of A4 paper. Handy wrapping paper storage box from Really Useful Boxes with two internal trays to store away bows, ribbon, tags, tape and scissors. Great size for storing under the bed when not in use. 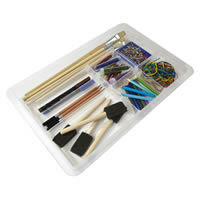 12 compartment storage tray great for storing crayons, paints, glue etc etc and can be used on its own or popped inside some of our other storage boxes. 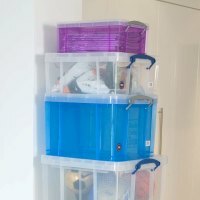 Storage tower from Really Useful Boxes with 5 x 12 litre capacity multi coloured drawers. 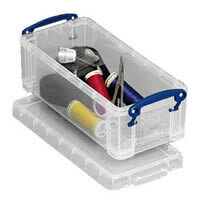 Long plastic storage box with a clip close lid that's an ideal size for paint brushes and knitting needles. 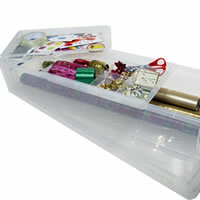 Great for Craft, DIY, or as a Sewing box, our hobby box has 2 removable divider trays to organise all your bits and bobs. 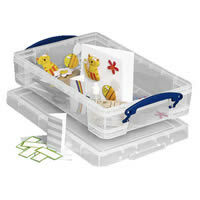 Makes a great toy box to keep all those little LEGO pieces in one place! 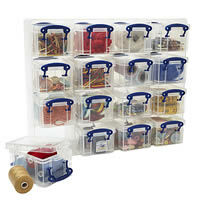 16 compartment storage tray great for organising all manner of craft items such as beads, ribbons, cotton reels etc. 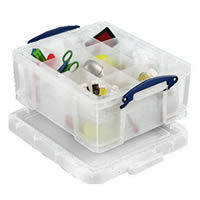 19 litre storage box with XL lid. Suitable for 5 reams of A4 paper, A4 suspension files or 50 LP records. 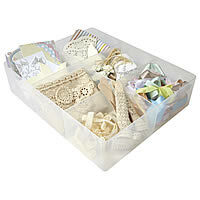 Our lipped stationery tray can be used on its own or as a complementary item to our 7 litre scrap book box. 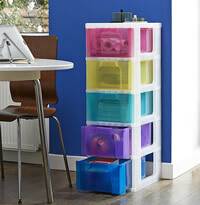 Robo storage tower from Really Useful Boxes with 3 colourful 0.9 litre capacity drawers. Ideal for keeping a desk/study area neat and tidy. 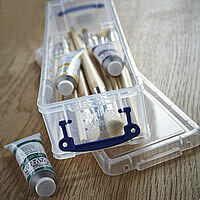 Storage tray split into 6 sections ideal for storing all manner of craft related items. 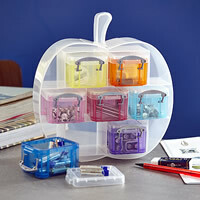 Desktop organiser in the shape of an apple with 7 brightly coloured 0.14 litre capacity Really Useful Boxes. 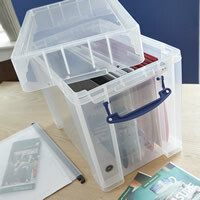 Translucent plastic 21 litre Really Useful storage box with two removable divider trays. 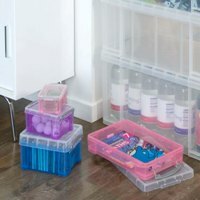 Great for storing craft items. Lidded storage box from Really Useful Boxes with a clip close lid. 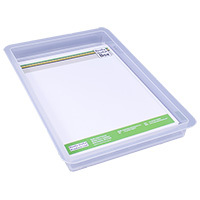 A perfect size for envelopes and card-making supplies. Our 9 litre Really Useful storage box is a great size for a full ream of paper for the kids, or sewing and knitting patterns along with cottons and needles. 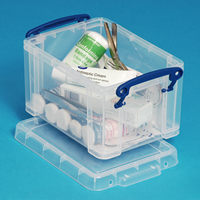 Robust lidded plastic storage box from Really Useful Boxes. Great for garden tools, craft storage supplies etc. Lipped A4 tray which can be used as an in-tray etc. 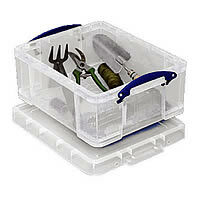 on its own or as a complementary item to our 4, 7 and 9 litre Really Useful Boxes. 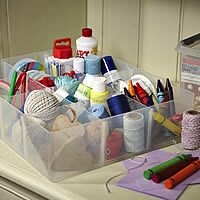 Low profile lidded craft storage box (35cm by 40cm) that's an ideal size for scrap booking. 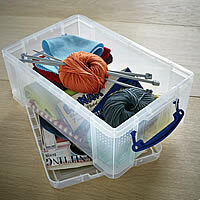 Robust lidded Really Useful storage box great for using as a desk tidy, mini first aid box, storing craft supplies etc. 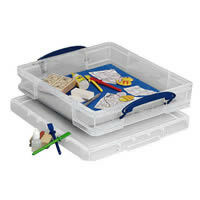 Clear plastic storage box with an easy clip close lid ideal for pens and pencils or for storing needles and cottons.